If you are in the beautiful Tuscan city of Lucca, there are some places not to be missed. Here there is a short but interesting list. 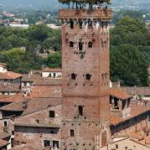 Another street you need to visit is the Via Fillungo, where you can find the clock tower, the Torre delle Ore, a Medieval tower you can climb to have a different amazing view of the city. The street, being famous for being the main shopping one in the historic center, is mainly pedestrian, so get ready to have fun around while buying souvenir or great deals. If you are in love with Villas, then you have to go to the Villa Giunigi’s museum. It is inside a XV Century villa and it is located near the east walls. Inside you can see both artifacts and artworks from prehistoric times through the XVII Century. You can also find a very large collection of local Romanesque, Gothic, and Renaissance art. Roman art fans can also visit the Piazza dell’Anfiteatro, the oval shaped square, which used to be the site of a Roman amphitheater. You can still see parts of the original oval ground-plan as well the and outer ring. All the buildings which are built around it date back to the Middle Ages, so it is very fascinating to see how different architectonic places can be put together offering a very beautiful view. Be ready to have your camera on and take all the shoots possible, since Lucca offers so much to visit and discover to its tourists.